Custom new baby girl announcement photo frame postage stamps featuring a pink frame with white radial dots. Add a photo of your baby. 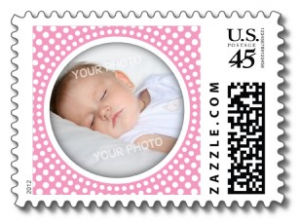 Great postage for birth announcements, christening invitations and other baby or child related mailings. Also available in other colors, custom colors are available on request. This entry was posted in BABY, Baby shower, Birth announcements, Christening/baptism and tagged Baby. Bookmark the permalink.